It is important to recognize the continued success of these solutions as they are testimony to Vertic and our clients’ innovative mindsets, ambitious visions and bold desires to push the boundaries of what was previously thought possible. 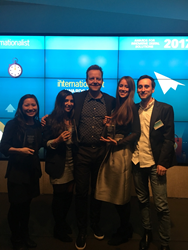 Vertic, a leading independent global digital ad agency, are celebrating a trio of prizes awarded last night at the Internationalist Awards. The awards for the redesign of GE.com, the redesign of SAP Ariba.com, and a Global Influencer campaign for ROCKWOOL. The Grand Prix for Best in Show was also awarded to Vertic for the redesign of Ariba.com. The Internationalist's Awards for Innovative Digital Solutions were established as an acknowledgment of how today's marketing strategy is affected by the media and technology revolution in a post-digital Age. The goal of the awards is to honor inspiring case studies that incorporate great strategy and proven results. Criteria for judging was based on a digital initiative’s capacity to create awareness, establish a brand, or drives sales through lead generation and conversion. Given the international nature of the awards, they furthermore look at how tactics lead to an innovative digital marketing strategy that can cross borders or be an exemplary local best practice to be implemented in other markets. The new GE.com in particular has been recognized as a benchmark within the corporate .com industry this year. Having already won awards such as Best Brand Website at the ACE Awards, Best Navigation Structure at the Webby Awards, and Best Usage of Data & Technology in a Website at the Drum Awards, this award makes up a quartet of prestigious triumphs for a site that launched at the start of 2017. The Grand Prix award win here for the Ariba.com redesign is expected to lead a similar flurry of honors in 2018.